12 Days of Cookies returns! Our third annual 12 Days of Cookies event returns! Our staff will be baking cookies and sharing them with the branches. Staff members sign on to bake a cookie recipe from a book they found in the library, and share the photo, recipe, book title, and the cookies with our patrons. We've had some great cookies pass by our desk in the past two years, so we are fairly certain that we are up to the challenge once again. It all begins on December 2. Each day (Monday-Friday) we will post a new cookie on this blog, Facebook, and Twitter. AND, this just in, we'll also be on Pinterest, so if you are a Pinterest fan, you can follow along there, too. The last cookie day is December 17. Since we have 12 branches, each location (including our Bookmobile!) will get to host a batch of cookies. Check in each day to find out where the cookies will be and to see how delicious they look (and to plan which branch you will be visiting). Of course, we want you to get in on the action as well. Just bake a batch of cookies from a recipe you found in a book from the library, and send us the photo. You will be entered to win a gift card. Details on how to enter can be found here. This is a fun way to discover a new cookie recipe, and you can get the kids in on it for a literacy lesson as well. Reading the ingredients together is a great way to add literacy to a fun family activity; measuring adds a bit of math to the activity. Being creative with your cookie decorating and photography is a great way to express yourself and add a bit of the arts into your holidays. Let us see your artistic side! So, get to the library and find a cookbook, and get baking! We can't wait to see the cookies roll in. If you are looking for health information you do not have to go any further than your library website. You can click on the Search Databases tab at the top of our webpage and find the Health and Wellness Database or if you are searching for titles in our web catalogue there is an option to connect to that database on the right hand side of the page. Whether it’s a specific condition that you want to know more about, a prescription drug or you need to find an association in your area, the Health and Wellness database can help. Tabs across the top and search boxes below help direct you to a variety of information. You can search by condition name or by symptom. There are “in the news” highlighted topics and articles that can be printed, emailed or downloaded. The best way to learn how to get the most from this resource is to take the Guided Tour listed at the top of the page. It will pinpoint and highlight all the search tools and tips to use this resource. Here are a couple of interesting features: The first one is a personal risk assessment tool that is available. Here you can calculate your own risk for certain diseases and get tips on how to lower your risk. The other is the video option that will come up with the results of a search. While watching the video you also get a transcript of the presentation and the credentials of the presenters. The information on this site is certified by the HONcode so has been evaluated as being trustworthy information. I think you will find this database to be very useful either on its own or in addition to the books found in our catalogue. Get your HOMEWORK done. Get Back to Your LIFE! 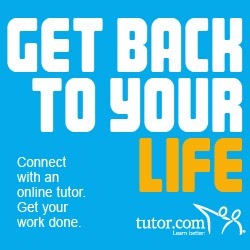 Tutor.com can help you get your homework done, write your paper or study for your test so that you can get back to doing the things you love. Don’t get frustrated and don’t stay stuck. Instead, grab your library card and log on to Tutor.com through the Annapolis Valley Regional Library to get the help you need, right when you need it. Tutors are available from 3 PM – midnight, 7 days a week. See what an online classroom looks like here. Students (and parents!) can get help for any kind of academic question in math, science, English, social studies and writing. The tutors work with students in kindergarten through 12th grade and even enrichment-level class work and intro-level college coursework. Connecting with a tutor is easy. You just need a library card and a computer or mobile device with internet access. Just point your browser to www.tutor.com/AVRL. This resource is free for AVRL library card holders—just another in the long list of reasons why you should have a library card! And if you create a FREE account, you can use the bonus features of Tutor.com – access to previous sessions, able to use the app (for iPad & iPhone); a “homework locker” which can store files that you can access from anywhere; and more! And if you find a tutor you really like, you can ask for that tutor when you log in. Tutors must go through a rigorous application process and several background checks in order to work for Tutor.com, so you know you are getting expert help. The tutors will be available seven days a week, from 3 PM to midnight, but there are many other resources available 24/7. And Tutor.com is not just for grade-school students! College students and adults returning to classes, and those looking for jobs can get help, too. So don’t stay stuck—get help online and let the library help you on your way to better grades! Connect. Learn. Go. Want to find out more? We are hosting a launch party at the Berwick Library on Wednesday, November 13 from 3 - 4:30 PM. Stop by to see how it works, and have a snack with us! I am a seasonal knitter, usually beginning mid-fall and continuing until about the end of February. The urge to pick up my needles is inspired by cool weather and a desire to create some unique Christmas gifts for family. This year I began a little earlier and am pleased to say that I’ve already completed a sweater for my two year old great niece, I guess her birthday was the spark that started me this year. Because I have started earlier than usual, I have more ideas of things I would like to complete before Christmas, maybe too many things. Your library is a great source for patterns and ideas. I know that I have found some wonderful patterns and ideas for my knitting projects in the many great books in our collection. 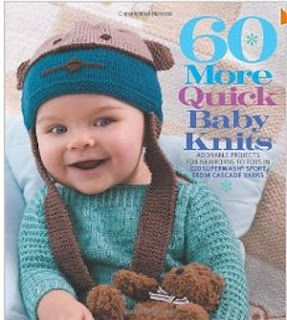 Some great titles are: Knitted Animal Hats, 60 More Quick Baby Knits, Cutest Ever Baby Knits, Not Just Socks, and Socks from the Toe Up. Maybe you would like some company as you knit. There is a knitting group that meets on the last Tuesday of the month in the Kentville Library from September to May. Several branches hosted knitting groups last year. Inquire at a branch near you or maybe you would like to start such a group. They meet and bring their knitting with them. It is an opportunity to talk with fellow knitters, share patterns and ideas. One of my new, but fast becoming a favourite source for knitting patterns, is Pinterest. It is just, WOW! You can see the completed project and then pin it to your account, so you have this wonderful, graphical source of patterns. Many of them are free, others are for sale as a downloadable file. Perhaps you are new to knitting or would like to learn. There are books for beginners in our collection as well. For a great source on-line try http://www.knittinghelp.com/ The glossary will tell you what all those abbreviations are, for example M1B, and many of them have a video included that shows you how to do it. 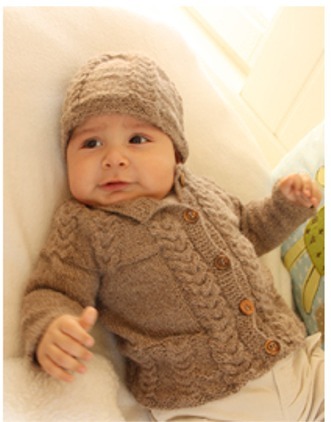 This little boy’s sweater is my current project, which I found through Pinterest as a free pattern. It will be a Christmas gift for my new great nephew. It is so much fun and very rewarding. Hopefully you will soon picking up your needles.